Well, that’s it. The Hunger Games series is over. Just like that. It seems like it was just yesterday that it was announced that the trilogy was going to turn into a film series, not four years ago. To prepare for Mockingjay Part 2, I decided to reread the final book and rewatch the Part 1. I have been impressed with how well the books have been adapted into film, and this last installment is no exception. The main difference between the books and movies is the change from first person to third person point of view. I really love how throughout the films we have been presented with what the Capitol and other Districts are dealing with. For example, being able to see how the Gamemakers control the Game, President Snow’s reactions to what is going on, and the Districts rebeling provided more world building. Probably my favorite scene of all is when the rebels blow up the bridge while Katniss sings “The Hanging Tree.” That scene is so well done and beautiful, but it is only one sentence in the book. I felt that the changes that were made made the story sharper. Instead of adding a new minor character, Effie was brought into District 13. Katniss training to go into battle was taken out and replaced with more time with Commander Paylor, which I found important since she was just randomly elected at the end of the book. 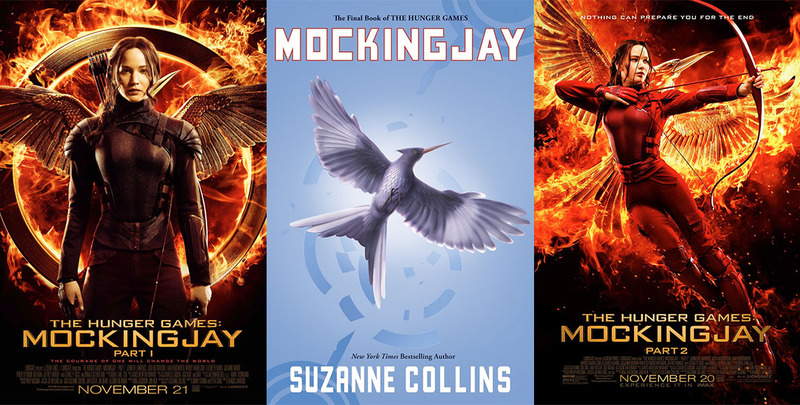 Overall, I thought Mockingjay Parts 1 & 2 finished the series off very strongly. If you haven’t gone and seen the final film yet, I highly recommend that you go soon! Be sure to rewatch the Part 1, though, because Part 2 literally picks up right where Part 1 left off at. The Hunger Games adaptations are my favorite out of all the book to movie adaptations out there (minus harry potter.) They did such a good job with it. They definitely set the bar when it comes to adaptations! I thought they did a great job, too! I especially thought that Catching Fire and Mockingjay (Parts 1 & 2) were fantastic adaptations!